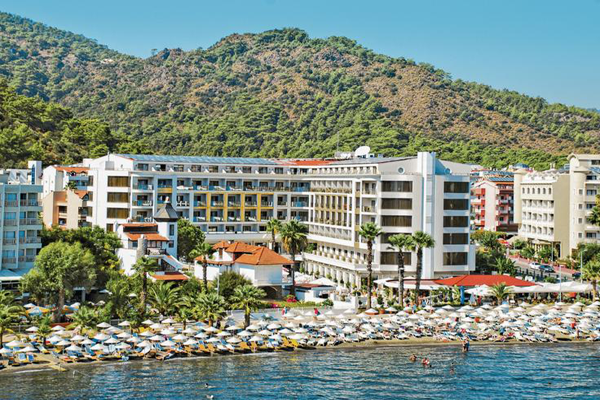 Set on the beachfront with fabulous views over the Bay of Marmaris, the Golden Rock Beach Hotek us a perfect base for a relaxing holiday in this thriving resort. 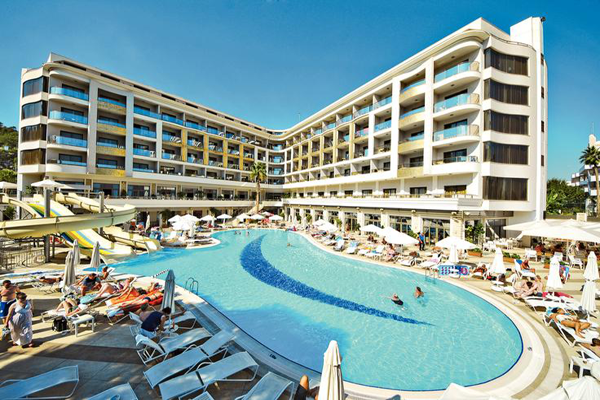 With a great pool area a range of facilities for families and couples alike, there is something for everyone. Children can have great fun in the kids club, whilst their parents relax around the pool or enjoy a treatment in the wellness centre. LOCATION: Directly on the beach with a private section for guests • 3km from Marmaris and 5km to Içmeler (both accessible via the beachfront promenade). FACILITIES & ACTIVITIES Outdoor pool with slides • Indoor pool • Kids' pool • Buffet restaurant • Pool bar • Lobby bar • Midnight soup • Fitness centre • Turkish bath • Darts • Hotel-run kids' club (6-12yrs ) • Mini-disco • Highchairs • Cots • EVERYTHING ELSE: Daytime activities and evening entertainment • Turkish night and shows • Reception • Wi-Fi in lobby. 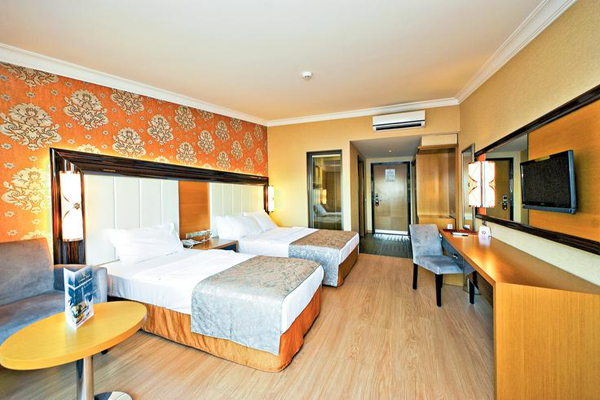 PAYABLE LOCALLY: In-room safe • In-room Wi-Fi • In-room minibar • À la carte restaurant • Laundry service • Room service • Billiards • Spa centre treatments • Fresh fruit juices and bottled drinks • Ice cream • Turkish bath, massage and scrub • Pool towels (deposit). ACCOMMODATION: Rooms (two−three people) have a double bed plus extra bed, individually controlled air conditioning, LCD television, hairdryer, shower room and balcony or terrace. AVAILABLE AT A SUPPLEMENT: Side Sea View Rooms • Sea View Rooms • Rooms for sole use. ALL INCLUSIVE: Here are just a few of the package highlights: Buffet breakfast, lunch and dinner; late breakfast available • Drinks 10am-midnight • Snacks available at selected times in the afternoon • Afternoon tea and cake • Activities including aquaerobics, waterpolo and table tennis.